Hey y’all – today we’re going to talk about how to add a ruffle to a garment. Ruffles are a fun, feminine detail you can add to pretty much any top or dress. For example, I added one to the hem of my Auberley Dress. Adding a ruffle is super simple to do. First, you need to measure or decided on how long your finished ruffle will be. Then subtract 1/2 inch (for a seam allowance) from that number, and then cut that amount off of the bottom of your dress or top. If you’re making your own ruffle, add at least 1 inch to the finished measurement you want for a hem and a seam allowance. 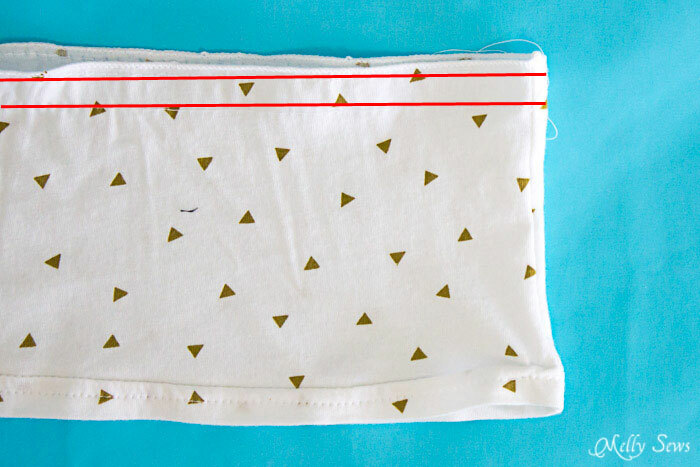 Depending on your fabric, you may want to add more than this; 1 inch gives you 1/2 inch on top for a seam allowance and 1/2 inch on bottom to make a narrow 1/4 inch hem. Next, you need to decide just how gathered you want your ruffle to be. Measure around the circumference of your top or dress. Then, take that measurement and multiply it by the amount you want to ruffle. 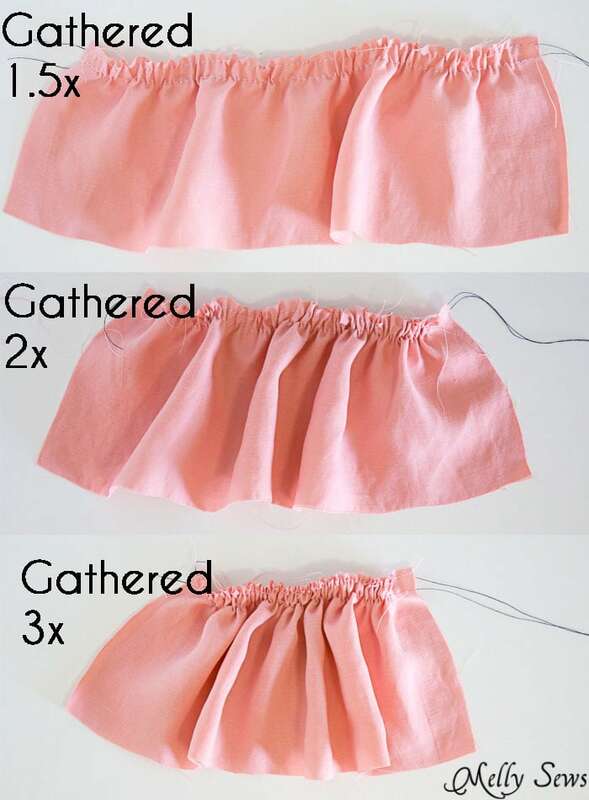 The more body you want the ruffle to have, the larger number you use, as in the examples below. 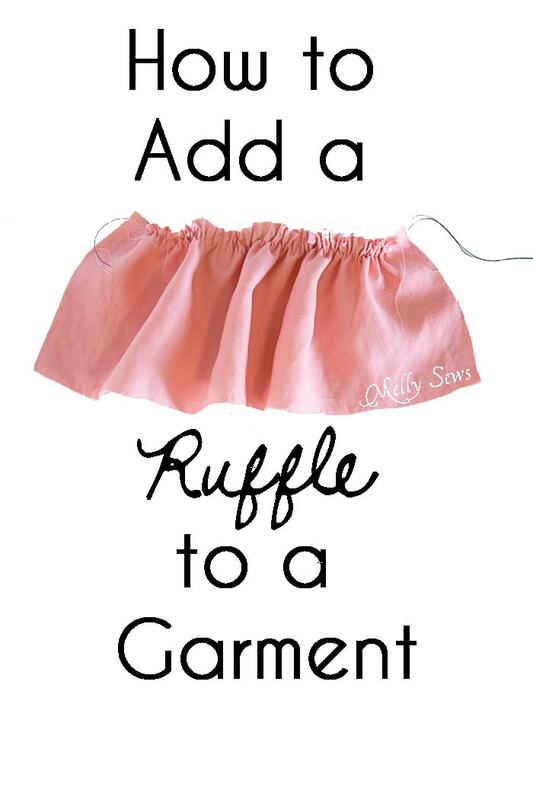 Cut a strip or strips of fabric to sew together to make the length you need for the desired amount of ruffle. Once you have a strip long enough, add 1 inch (for seam allowances), then cut the strip and sew it into a loop, right sides together, matching short ends. I find it’s easier to hem your ruffle before ruffling it. Then I baste 2 lines around the top edge to gather my ruffle. I cover some other ways to gather fabric in this post; just know that if you use any of those you should probably have an extra long strip of fabric and cut it to size after you ruffle it. But with this method, you pull on the basting threads to gather your loop to the exact width of the top or skirt you’re adding the ruffle to. Finally, attach the ruffle. There are two ways to do this. The simplest is show below – you match the ruffle to the raw edge, right sides together, and stitch, then finish the seam. 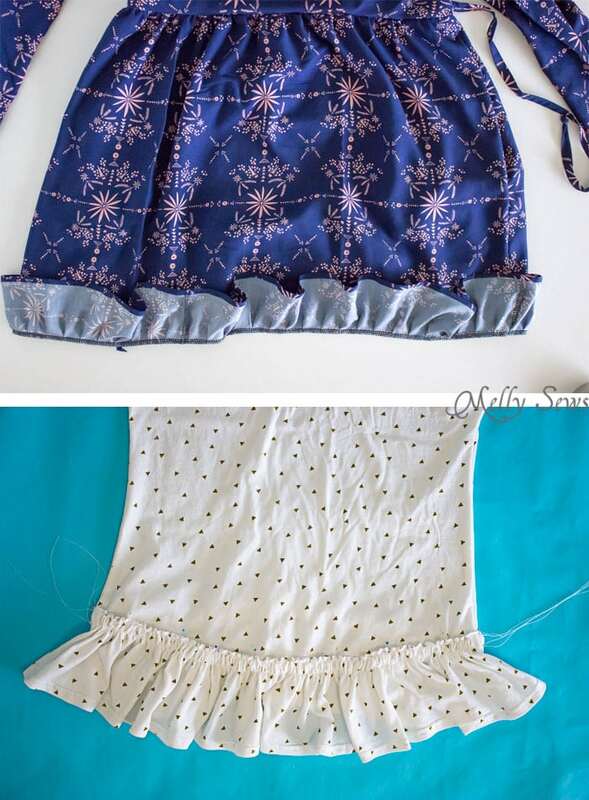 However, it can add another dimensional detail to finish the edge of your top or skirt first, then apply the ruffle on top of the finished edge and sew it in place with topstitching, as I did in this top. 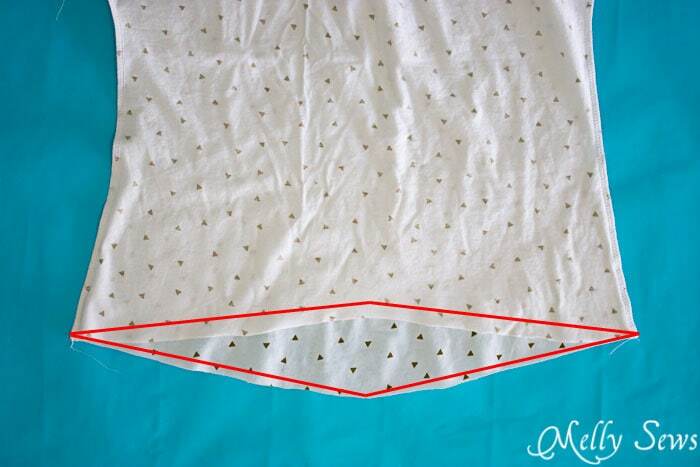 Just keep in mind that if you choose this method, you need to hem the top edge of the ruffle. I used a rolled hem on mine. And that’s it – how to add a ruffle! As for that Blanc T-shirt I’m wearing above, I’ll have more details on this in the next post. Very sorry to hear about your dog. Read about it in the enewsletter.